The RV-14 has one shortcoming if you have a shortcoming....The RV-14 needs work to fit short people. The airframe is just not the best fit for anyone under maybe 5'8" or so. Maybe a little less. Yes, the seats can move from hinge point to hinge point and be moved forward. But for my wife and daughter at 5'2" - 5'3", even with the rudder pedals in the full aft position and the seats full forward, they are nowhere near able to reach the pedals with their feet. It takes a full 3" of block on the pedals to make it acceptable. Now this wasn't shocking to me anyway, since I had to do the same thing in my RV-10 for my wife and daughter. See this write-up from 2009 when I did it in my RV-10. 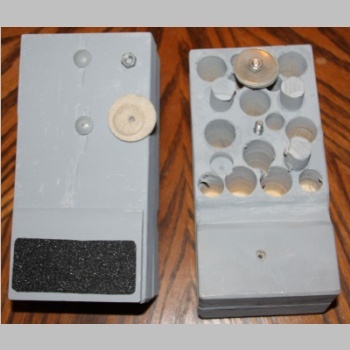 Basically, I glued and screwed 2 blocks of wood, into a single pedal block, I think about 8.5" by 4.25" x 3" thick. Then you use a router and cut out a slot for where it overlaps the bottom bar on the rudder pedals. Then, I drilled and glued in dowel pins on the back side of the block, to fit into the holes in the rudder pedals. This was to prevent the pedals from being able to twist or move much out of their proper position. On the RV-10 due to it's pedal hole design, I used 2 bolts to hold the blocks on the pedal. 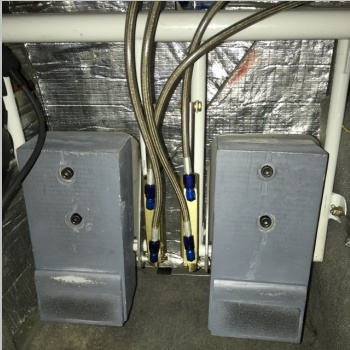 The blocks also hang down about 2" below the bottom bar on the rudder pedals. 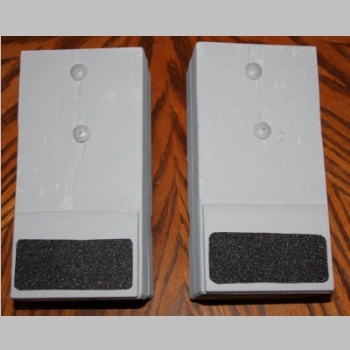 This is because their feet are smaller and to be able to rest their heels on the floor and hit the blocks it will take a lower pedal. Then I drill a ton of holes in the top half of the back to lighten the block of wood a bit. I did not drill the bottom to lighten it, because this will help give it mass to help release the brakes if your feet aren't on the pedals. I glued or screwed on a piece of moulding trim on the front, and even on one pair added anti-skid tape. They worked well for my wife ever since 2009. 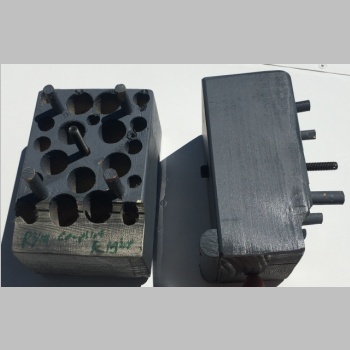 The RV-14 required a little modification to the block design though. I created 2 pairs of blocks for the RV-14 and built a 2nd pair of blocks for the RV-10 recently, to allow both wife and daughter to fly together. The RV-14 pedal design doen't lend itself well to 3/4" dowels like the RV-10 does. The holes in the back side don't line up perfectly with the ones in the front side. Instead, I laid the pedal on the blocks and drilled 4 holes in the outer levels, where I could get 5/16 dowels into the pedals to come out the back side of the rudder pedal. Then used a single center bolt to bolt it on. Previously, I had used carriage bolts, with nuts and large flat fender washers on the back. 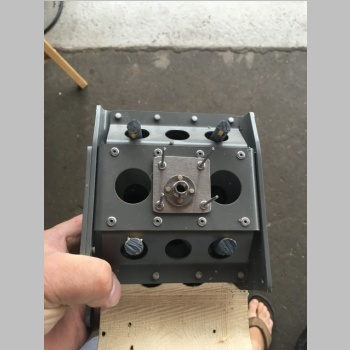 (See the below old pics of my RV-10 pedal blocks near the bottom of this page) This was OK, but in the RV-14, and the RV-10 for that matter, it is VERY hard to get up there to remove the nuts. After struggling with both planes for a while I decided to solve it once and for all. I wanted aft mounted nuts so I could insert bolts thru the front and tighten them from the fronts side. 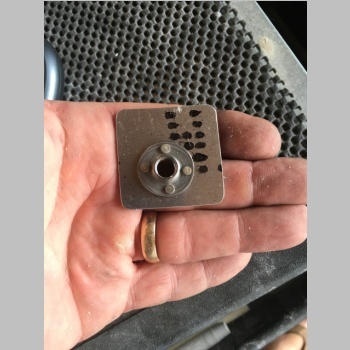 Nutplates are available but remember you're looking for coarse thread hardware store bolts to fit, so rather than AN hardware I went to Amazon and got these: "The Hillman Group 4145 5/16"-18 x 3/8" x 7/8" Stinless Steel Round Base Tee Nut (8-pack)". I wanted stainless and these had 2 holes in them already to rivet with. I drilled 2 more to make 4. 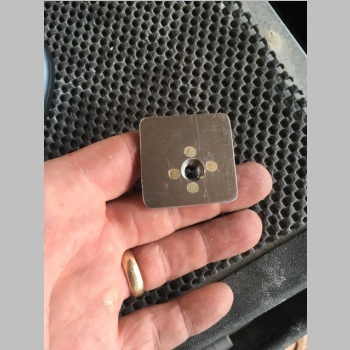 On the RV-14 I mounted them to small square aluminum plates that I pop riveted on to the back of the pedal, centered in the center pedal hole. 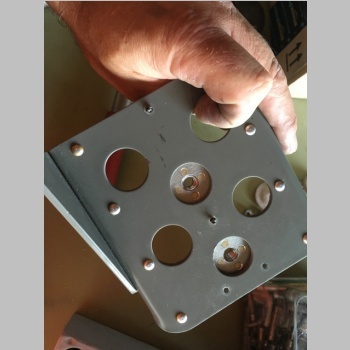 On the RV-10 I made a longer plate and riveted 2 of them to each pedal filling the 2 center column holes. Now I had permanent nuts on the pedals. 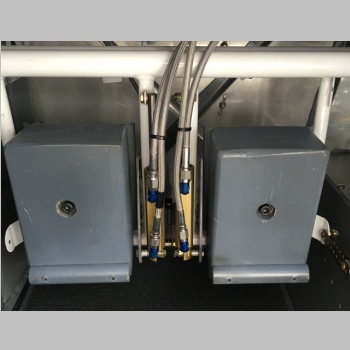 Here are some pics of the Tee Nuts as installed from a front view on the RV-14. With the nuts in place, I bought some 4.5" (those are too long...4" is plenty or even 3.75" probably) 5/16-18 socket head cap screws. I then used a boring tool to bore a receptical into the front of the pedal where the carriage bolt used to sit. That way the head of these bolts wouldn't stick out. Then I inserted flat washers to give them strength, into that bore. To install these blocks, you could use a lightweight 1/4" allen key. I was leaning that way for cheapness sake but, with the long reach required, I figured I'd go all out and I bought, also on Amazon, a pair of "Bondhus 46512 1/4" Hex Tip Cushion Grip Loop T-Handle with ProGuard Finish, 9.9", 2 piece". 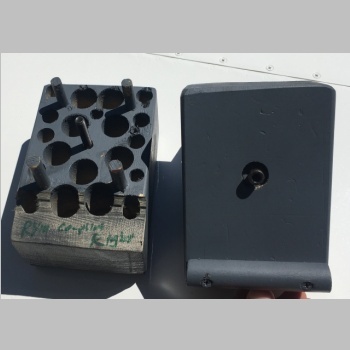 These come 2 per order, so one per plane, and they make installing these rudder blocks a breeze. Now I'm all set with both planes for the girls to be able to fly whenever they want, with much less hassle. 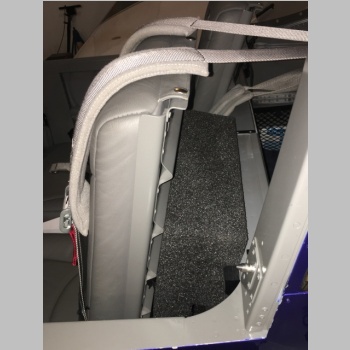 In addition to the rudder pedals needing to be moved back, we also needed to move the seat back further forward than what the flip-up seat back support would allow. 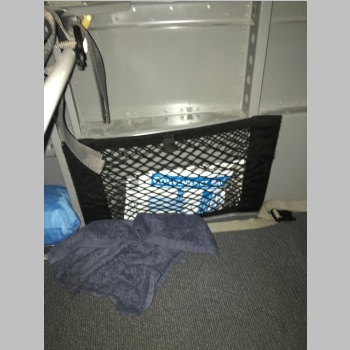 Since I don't need to use it at all, I completely removed the weak flip-up seat back tilter, because the girls need about 4" of movement to the seat back to be able to fly. I was looking around for something to stuff back there one day with the tilt mechanism removed, and came across the idea that something closed-cell firm foam would work well. 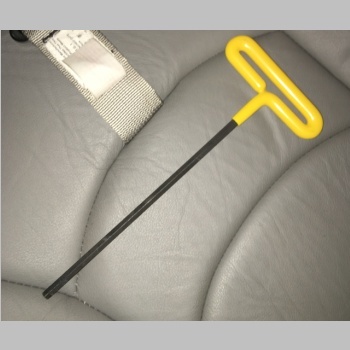 I grabbed an old 4" swimming noodle and cut it in half and stuck it behind the seat in 2 vertical posts for the seat back to rest against. It was pretty close to what we needed. The only real issue is I didn't want something that could easily fall out in flight, so I decided to modify it a bit. 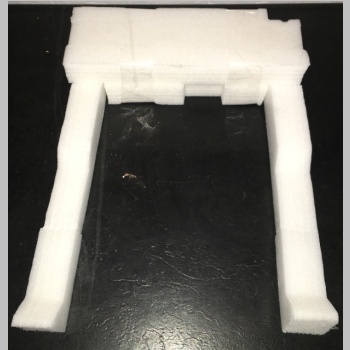 I grabbed a shipping box and pulled out the white foam that was in it, and taped up a piece as a test. 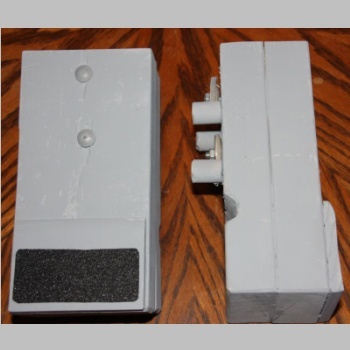 See the first pic below for that prototype. 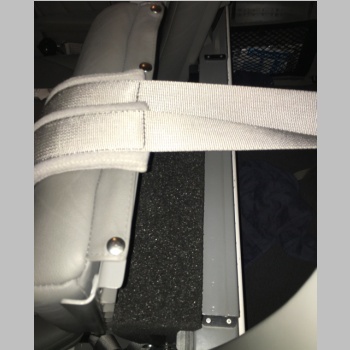 It had 2 legs to stand on, to keep the foam block at the proper height on the seat back. That way it couldn't fall down out of the way. 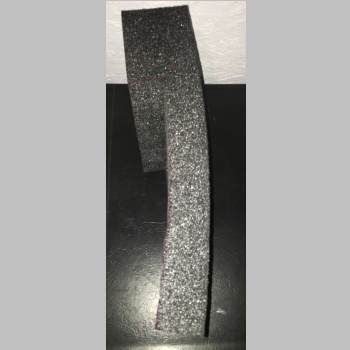 After a flight test it worked well, so I bought some large rectangle blocks of 4" thick foam that is just like those swimming pool noodles. I think they are 15" wide by 18" tall or so. 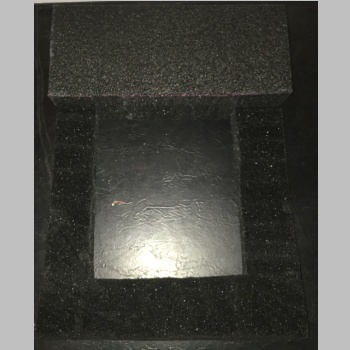 I created a hollow rectangle of the foam where the top is 4" thick but only on the top horizonal section, so if you want to have only 2" of titlt, you can just lift the foam block up and rest it on top of the seat support bar. This gives the seat the extra adjustability they need, and the blocks weigh almost nothing. The block of foam is much bigger than it needs to be. I could thin out the vertical legs and remove or thin out the bottom cross bar too. The benefit to having the cross bar on the bottom is it keeps those 2 legs from being flimsy and it positions them right between your seatbelt attach points. 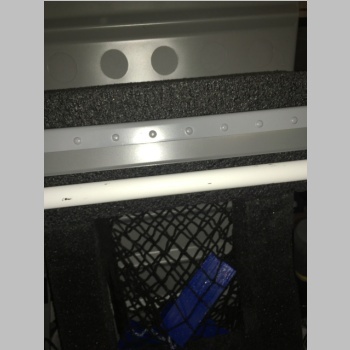 Here are some pics of the seat block installed. 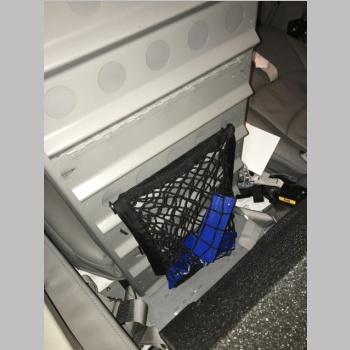 In the first picture you can note that if you lifted up the foam block about 3" it would then give you a 2" seat back support, and the additional thickness of foam would just be above the seat support crossbar. 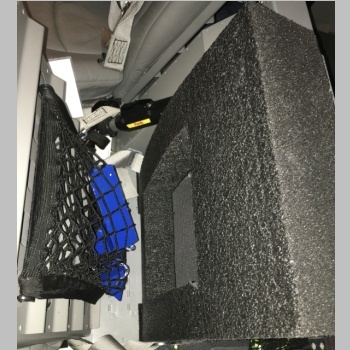 In the 3rd pic below you can see that the hollowed out area gives room for my mesh elastic seat storage bag to fit in that hole in the foam block. It's a handy place to keep my wheel chocks or anything else I need handy. I have one on both seat backs. Here's a pic of that seat bag, and one that I have velcro'd on to the side walls on each side for additional storage. 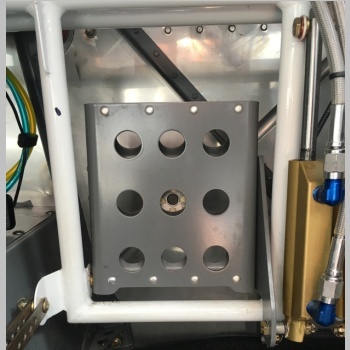 Here are some pics of the Tee Nut install on the RV-10 pedals. Note that the RV-10 pedals are of a flat design as opposed to the 2 layer pedal that the RV-14 uses. 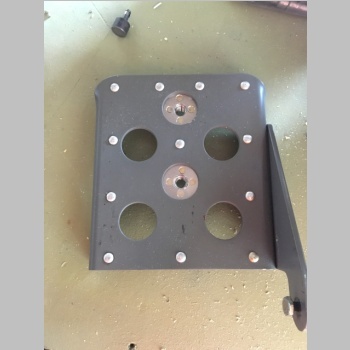 The RV-10 pedals also have a staggered hole pattern. I think it would be possible to do it with just a single Tee nut in the more centered of the 2 holes, but I had 2 concerns. One is that I had been having good luck with the 2 bolts so far, and I didn't want to mess it up or re-do this job once I did it. 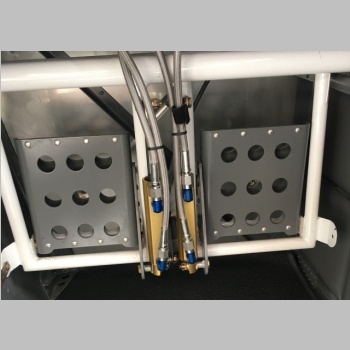 The other is that the RV-10 pedals are higher off the floor and require the pedals to hang maybe 1.5" lower below the bottom bar than the RV-14 pedals do. 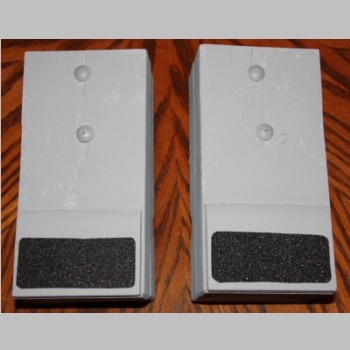 This would mean that you could potentially push more on the bottom of the block and that would have a tendancy to pull the top of the block off the aluminum pedal. So keeping the top bolt would give it a more solid attachment to the pedal and prevent any issues with this. It's only 4 total bolts per pair of pedals so I wasn't too concerned with the extra hassle. 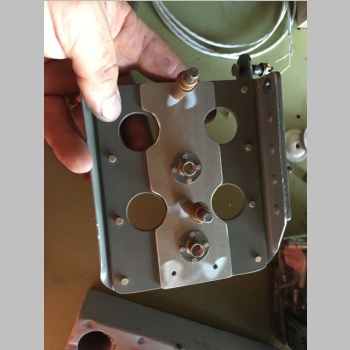 Here are some pics of the original RV-10 rudder pedal blocks I have been using since 2009. 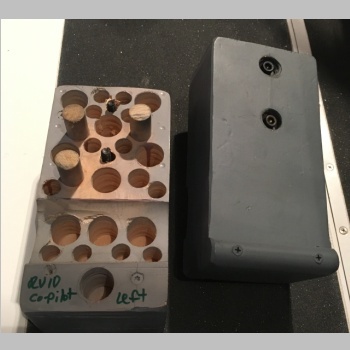 Since then I have counterbored and used the same (but shorter) capscrews, and a washer, recessed into the block just as the above RV-14 pedal blocks. 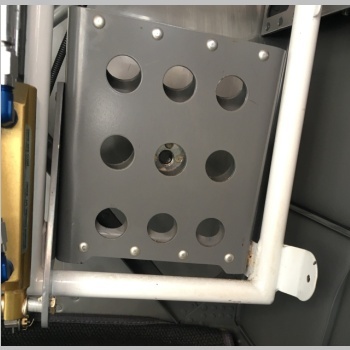 Of special note is that the dowel pins on the RV-10 pedals are much larger, because I needed to more fully fill the hole in the pedals to keep them from rocking back and forth. 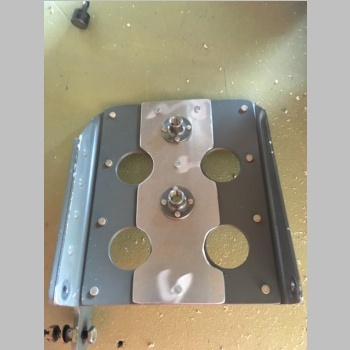 The RV-14 pedal dual layer design won't allow the use of big dowels because the holes aren't in perfect alignment, so smaller dowel pins can be used that actually will fit through both layers of the pedal. 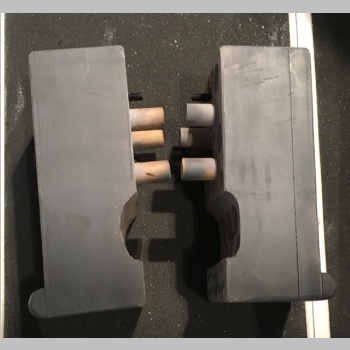 Here is a picture of the RV-10 rudder blocks as they are today.